Halloween is in the air. It’s the time for the young and the young at heart to dress up and exhibit their spooky and dashing costumes along the neighborhood. Each kid knocks door to door to say “Trick or Treat?” A trick would mean doing naughtiness to the neighbor who wouldn’t give them a treat. A treat would be anything from candy, sweets or money. The recipe, that I am sharing, is an alternative to the usual treats given. It is easy to prepare and kids will surely love this. As an option, you could put them inside a box or wrapper. 2. Pour the melted butter in a mixer’s bowl and start the mixer. Then pour the confectioner’s sugar and brown sugar till you get a creamy mixture. 3. Add the egg, milk and vanilla. Then gradually incorporate the rest of the dry ingredients until combined (flour, salt, and baking soda). 4. Add the chocolate chips but don’t over mix. 5. Refrigerate the dough till ready to bake. 1. Preheat oven at 375° F.
2. 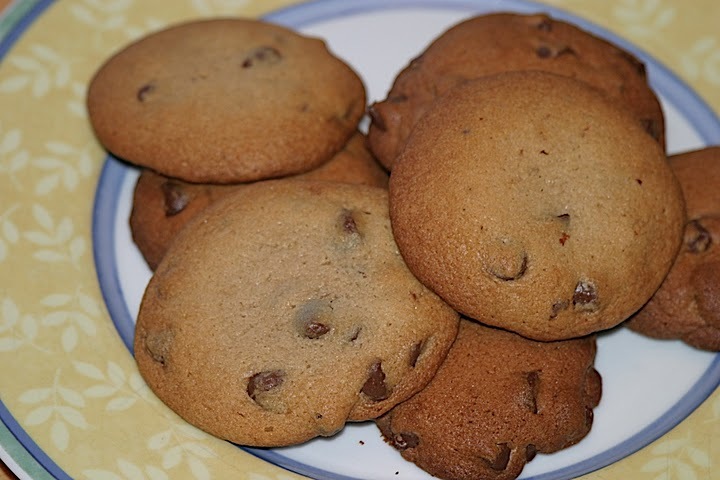 Place parchment paper on baking sheets, then using a spoon, place about a tablespoon worth of dough for each cookie. 3. Then bake for 10-15 minutes. All those kids in the neighborhood will surely come knocking at your door!